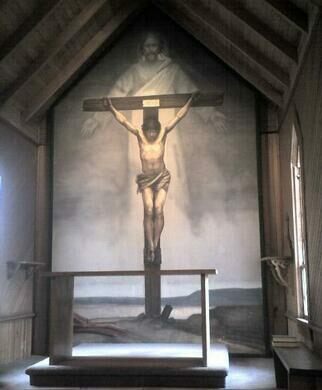 Rural churches in the middle of nowhere with religious frescoes by famous artist. 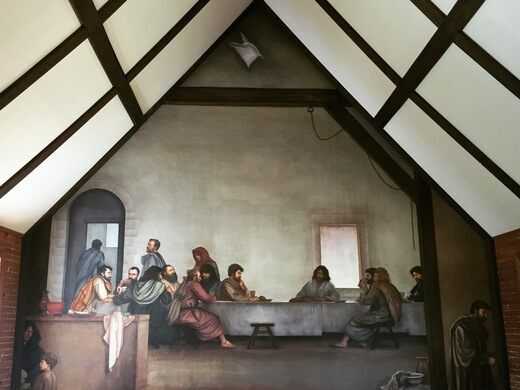 A small church in North Carolina was the first to be graced by large, Italian-style frescoes painted by an American artist who studied with Italian masters. North Carolina native Ben Long grew up as an artist. After serving in Vietnam as a Marine Corps Combat Officer and Commander of the Combat Art Team, Long went to Florence, Italy to spend 8 years apprenticing in the art of fresco painting. Returning to the US in the mid-70’s, there wasn’t much demand for his newly honed skills. 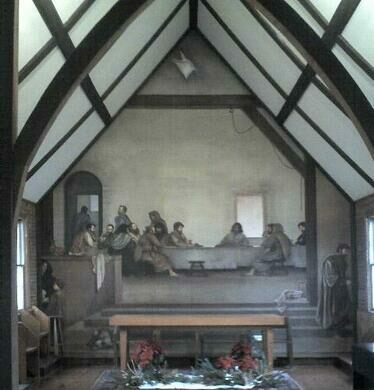 After a chance meeting with an Episcopal minister of two small churches in the mountains, Long offered to gift the churches with his talent, using locals as models for his recreation of the Last Supper painting. It is said that the minister had agreed to the paintings without even knowing what a fresco was. The result was a series of large scale, lifelike “true frescoes,” meaning that they are painted in the Italian tradition on wet plaster. Also true to tradition, the models for saints and apostles were local citizens. Long also has paintings on display in such notable collections as the Smithsonian, as well as frescoes in Italy at the Abbey of Montecassino, and 11 other frescoes in the US. More of his work in North Carolina can be seen by following the “Fresco Trail” set up in 2005. When visiting these small sanctuaries, people often leave comments in a guestbook. Reading the entries reveals the sense of serenity and uniqueness of this generous creative spirit of artistic work. The highest point in Virginia can only be reached by passing through ponies and flowers. An abandoned eight-sided home built for a plantation owner during a brief octagon craze in the 1850s.